Are you lost concerning the direction your health is going? Are you struggling on the journey to your ultimate wellness destination? The Wellbeing Compass is here to guide you back to the right path so you can trek your Health Course with confidence. RECLAIM YOUR HEALTH – UNLEASH YOUR LIFE! Use the Wellbeing Compass by hovering over and clicking on each area to learn more about the stressors and root causes hindering your Natural Health Course! My Wellbeing Compass™ is an interactive tool that enables you to navigate the pitfalls of, and ultimately reroute, your Health Course. At the core of your current Health Course is a state of ongoing imbalance perpetuated by chronic stress. This chronic stress is sustained by a plethora of unresolved stressors: biochemical, structural, electromagnetic, emotional, mental, and spiritual. Bottom line, your chronic stress feeds your illness… it is defeating your body’s natural capacity to self-heal. Stress is the body’s reaction to a physical, mental or emotional strain or tension. It is brought upon by physiological, psychological and environmental events that the body perceives as challenging, threatening or demanding. Distress or chronic stress is uncontrollable, prolonged, or overwhelming stress. Once stress becomes distress, the body manages to survive though not always to thrive. The body is made up of intelligent, living cells that are dynamically connected. They communicate and just know what to do and when to do it in any given situation. They grow, replicate, repair, and age. Every 90 days, the body has a new bloodstream; every year, it manufactures billions of new cells; colon cells refresh every 4 days; the skin is entirely regenerated every 2-3 weeks; white blood cells regenerate in about 1 year; the liver renews itself at least once every 2 years; and the skeleton replaces its cells entirely every 10 years. Biochemical stressors may impact, challenge and threaten our body’s function, composition and performance from the single cell, through organs and organ systems (e.g. heart, liver, GI tract, immune function, etc.) right up to the whole-organism level and the function of our brain. Major biochemical stressors include dehydration, insufficient sun exposure, nutritional deficiencies, food sensitivities, acidity, inflammation, toxicity, and an imbalanced microbiome. Since our emotional and mental states are greatly influenced by the integrity of our physiology, these stressors affect every aspect of our wellbeing. Structural stressors may impact, challenge and threaten our musculoskeletal system which is the load bearing structure within us, providing our form, stability and movement. When we are exposed to structural risk factors, our body begins to fatigue. Structural stressors evolve when fatigue outruns our body’s recovery system. Over time, as fatigue continues to outrun recovery and the structural stressors persist, musculoskeletal disorders, neurological and degenerative conditions as well as cognitive/emotional problems may develop. 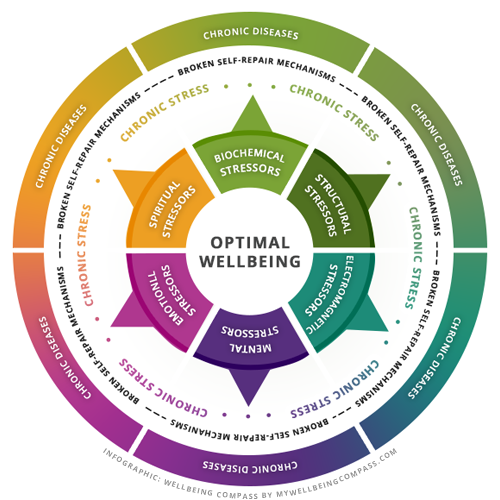 Major structural stressors include structural misalignment, limited mobility, tightness/stiffness, improper spinal posture, inflammation and chronic aches/pain. Electromagnetic stressors are environmental in nature and are the byproducts of repeated exposure to electromagnetic fields (EMF) radiation and radio frequency (RF) radiation. They may impact, challenge and threaten our neurological and endocrine systems, wreaking havoc on our body. Major electromagnetic stressors include oxidative stress, nutritional deficiencies (due to the body’s compromised ability to absorb nutrients), spine & nerve interference, suppressed immune system, poor sleep patterns, and meridian energy imbalance. They comprise repressed emotions (especially fearful or negative ones) and may zap our mental energy, negatively affecting our body. On the other hand, emotions that are freely experienced and expressed without judgment or attachment tend to flow fluidly without impacting our health. Major emotional stressors include limiting emotional patterns such as fear, sadness, loneliness, anger, hurt, despair, etc. Our thoughts, attitudes, perceptions and beliefs have a direct impact on our physical and mental health. An upbeat attitude can in itself mobilize and stimulate our body’s self-repair mechanisms. Recent studies show that severe prolonged stress and chronic negative thinking can compromise the immune system. By the same token, studies have also revealed that individuals with a positive attitude toward life tend to become sick less often than those with a negative attitude. Major mental stressors include limiting mental patterns such as self-criticism, self-judgment, self-rejection, pessimism, etc. Major spiritual stressors include: lack of authenticity, lack of self-actualization, and lack of self-love, and lack of trust in the process of life (or in a Higher Power). Want to navigate your way back to natural health and optimal wellbeing? Gain knowledge to take control and take action to reclaim your natural health and optimal wellbeing. Uncover the core of your Health Course— the combination of your chronic diseases, conditions, symptoms and the history that binds them together– which is multi-layered and multi-dimensional. Discover the why rather than just the label of what you’re experiencing because that’s the only way to self-discovery and a more lasting cure. Natural health (or holistic health) is your overall state of wellness on all facets of your being: physical, emotional, mental and spiritual. It encompasses the health of your entire being and extends to everyone and everything that interacts with you in any way. That includes your resources, your environment, and your relationships. Although we are accustomed to dealing with each of these facets separately, in reality, body, mind and spirit are completely interconnected and interrelated so much so that what happens to one can greatly affect the others. When we are in a state of natural health, we proactively tend to, nourish, and nurture each one of our facets to support an overall state of equilibrium within and amongst the facets. FACT: Your body has the power to heal itself. Your body is unbelievably resilient! It’s designed to self-balance, self-correct and self-heal, all on its own! Equipped with natural self-repair mechanisms that heal wounds, kill cancer cells, fight pathogens, repair DNA damage, keep coronary arteries open and naturally fight the aging process. All of these amazing things happens when your body is wisely supported and nurtured. So, what’s preventing your body’s healing power? Stress is the body’s reaction to a physical, mental or emotional strain or tension. It is brought upon by physiological, psychological and environmental events that the body perceives as challenging, threatening or demanding. Distress or chronic stress is uncontrollable, prolonged, or overwhelming stress. Once stress becomes distress, the body manages to survive though not always to thrive. For example, when faced with periods of chronic stress, the body’s immune system function is lowered, and the digestive, excretory, and reproductive systems no longer function the way they should. In a state of chronic stress, the cells of the immune system (and other body systems) are unable to respond normally and produce levels of inflammation which increase the risk of further health issues. YOUR CHRONIC STRESS IS DEFEATING YOUR HEALING! When your body is in distress, its natural self-repair mechanisms are weakened and malfunction. In other words, in a state of chronic stress, your body manages to survive but can’t thrive. Did you know that the United States is ranked #1 in degenerative disease and #150 in general health? Are you aware that Americans are some of the most malnourished people on the planet, with over 1 MILLION people dying annually of heart disease…alone? …Learn to cultivate more of your relaxation responses on a regular basis. CLICK HERE TO GET TO THE CORE OF YOUR HEALTH AND STEER YOUR OWN COURSE NOW!